Atonement theology is one of my passions. The cross of Jesus Christ is at the heart of our faith and the task explaining and displaying it’s ironic beauty the glorious means of our salvation is an unavoidable call for any preacher of the gospel. For that reason, atonement is one of the subjects I spent a good amount of time (and money) reading about in seminary. While I thought I had most of my ducks in a row, I’ve recently dipped back into exploring some recent work in atonement theology that’s been very helpful in sharpening up my thinking in these areas. I wanted to briefly commend two excellent works to you, my readers, for your attention and edification. Hopefully, you read this in time to update your Christmas list! 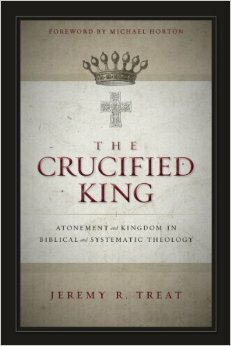 First, is Jeremy Treat’s offering The Crucified King: Atonement and Kingdom in Systematic Theology. In one sense, I found it to be a gravely disappointing book. It’s disappointing because Treat has written the book I wanted to write on the subject. Giving equal attention to biblical theology and systematic categories, Treat reunites what never should have been divorced in much modern theology: kingdom and cross as well as Christus Victor and penal substitution accounts of the atonement. One of the key strengths of his biblical theology section is his ability to go beyond key proof-texts to showing the broader, redemptive-historical framework in which the kingdom and cross fit beginning with Genesis through Torah, the Prophets, the Gospels, the Epistles, and into Revelation. From there he examines the important concept of the threefold office of Christ, and argues that for too long we have failed to recognize the way Christ’s kingly work is central to his cross-work and vice versa. Christ brings the kingdom through the cross; Christ conquers his enemies and saves his people by dying a penal death in their place. Beyond that there are some excellent sections engaging Wright’s conception of the ministry of Jesus, Moltmann’s account of the kingdom, and challenging reflections on the cross-shaped kingdom Christ invites us into. At this point, I think it’s safe to say that this is the work future theologians and biblical scholars will need to reckon with when writing on the relationship between kingdom and cross. In my opinion, it also definitively puts a nail in the coffin of any attempt to bifurcate or oppose Christus Victor accounts and penal substitution. This can only be done by ignoring both the broader sweep of the biblical narrative, and key texts linking the two firmly together. For a good preview of what this all looks like, check out this short article by Treat over at the Gospel Coalition. If all this isn’t enough to persuade you, just know two things: this is basically Treat’s dissertation written under Kevin Vanhoozer’s direction. Also, I met him at ETS and he’s a smashing chap. 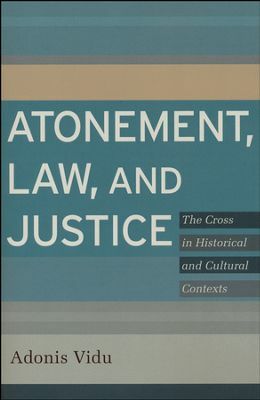 Second, in a very different register, Adonis Vidu has delivered an important contribution in the ongoing conversation about cross in his sophisticated Atonement, Law, and Justice: The Cross in Historical and Cultural Contexts. Theology happens in complex social, intellectual, and philosophical contexts. Oftentimes we fail to appreciate the thrust and shape of historical theological positions because we do not attend the way dominant intellectual frameworks shape the language used and intellectual and moral concerns of the time. This is eminently true of historic and contemporary atonement theology. Vidu aims to provide an account of the history of atonement theology down into the present that presents theologians against the background of the various legal and political theories dominant at the time. In this way, we can begin to appreciate better the way these theological concepts shaped and were shaped by their native settings. Five judicious, careful, and lucid chapters are devoted to the descriptive task, focusing on Patristic, Medieval, Reformation, modern, and contemporary periods. (All of the chapters are well worth the time, but he chapter on contemporary atonement theologies is very helpful for navigating the complicated and less accessible literature.) What’s more, along the way, he corrects a number of common misunderstandings and caricatures of historic positions. For instance, in the first chapter, Vidu corrects the oft asserted charge that the newness Christian theology was its assertion of the gratuity of forgiveness as the mere release of debt without the need for repayment. On the contrary, given Hellenic conceptions of justice as order, positive law, and the maintenance of relations, there was no “cold legality” being overturned here. Indeed, he shows the way these ideas influence patristic accounts for understanding the nature of God’s law and their tendency to attribute the retributive function of the law to the accuser, instead of considering it a necessary expression of his just will. In this, then, certain Christus Victor accounts rest on common, Hellenic intuitions about justice. At the heart of the book lies the contention that all the shifting paradigms for relating law, justice, and atonement are, at bottom, debates about God’s nature and agency in the death of Jesus. For this reason, Vidu’s last chapter argues for the importance of not neglecting the doctrine of God’s simplicity in our account of God’s atoning action in Christ. Though there are currently some heavy objections being lodged against it, Vidu forcefully makes the case that abandoning simplicity will have serious, deleterious effects for our ability to understand the unified, non-conflicted, saving activity of God through Christ’s cross. Instead, he delivers a nuanced, modified account that is able to preserve penal atonement accounts from the sort of mistakes and caricatures it is often saddled with by both detractors and proponents. While I’m reticent about a couple of the moves Vidu makes with respect to relating the agency of Father and Son on the cross, this is an overall salutary contribution on the subject. I have not even begun to do either of these works any justice. I do hope that some of this whets your appetite and inspires you to check out either one or both of these timely and edifying works. For more, you can check out my larger post on 19 Objections to Penal Substitutionary Atonement, in which I tackle related issues and point you to more resources. P.S. If you’re interested in atonement, check out the line-up for the January 2015 LA Theology Conference all about atonement: Ben Myers, Elenore Stumpe, Michael Horton, Bruce McCormack, and a whole lot more. Sign-ups are still going here. Thanks, Derek. I read the reviews and purchased them on Amazon. Happy Thanksgiving! The Crucified King was already on my wish list. Now I’m even more excited to buy it. The other book sounds really good too. Thanks for the recommendations! Will you update and mention Fleming Rutledge book?